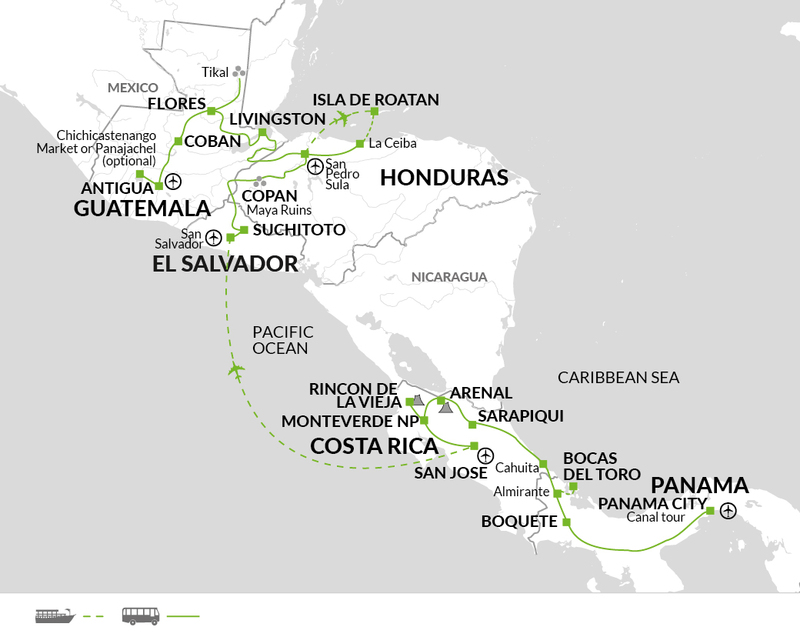 On our Central America overland tours we visit a number of national parks, including the Monteverde Cloud Forest Reserve and Rincon de la Vieja in Costa Rica, and Bastimentos National Marine Park in Bocas del Toro. With thousands of visitors each year, good administration and management of parks is essential in order to preserve these delicate eco-systems and fragile environments. We actively encourage clients to carry all waste out of parks, walk only on designated paths, and not to pick flowers or disturb the natural resources. When staying within these parks we use locally owned accommodations which minimise the negative impact of tourism on the surrounding area through conserving water and electricity and employing local staff instead of hiring from the bigger cities. The local tour leader and guides that we use in these areas are instrumental in educating tourists on how to make their visit positive for the environment and surrounding communities. At Copan, we give our customers the opportunity to visit Macaw Mountain, a Bird Park and Reserve that started off simply as a place to care for abused, hunted or smuggled birds, but which has now begun to develop release programs for Scarlet Macaws, as well as working with the communities to educate and raise awareness of the need for environmental protection. This program has already started to increase cooperation and a sense of pride in the local area, and in 2016 an area of 870 square km around Copan and the ruins was legally declared a protected area for the Macaw, as well as being a symbol for many other projects such as reforestation. A visit to the Macaw Mountain Reserve contributes to their projects. This trip is mainly an overland adventure, which means that we are constantly visiting small communities where we encourage our groups to shop and buy produce from the local people - at the Masaya Market for example, the stallholders earn a living from selling their handmade goods, which is excellent quality and a great place to buy souvenirs. Our knowledgeable and passionate tour leaders will advise on the best places to contribute and spend money.